We have heard that our application was successful. Even better news is that Ealing council has agreed to match the funds from the Groundwork charity. This website is one of the first fruits, which we call the RedGreen Group project. Red stands for Retired and Extremely Dangerous. The name comes from the need, twice a year, to book a local venue for a summer BBQ and a winter lunch and our social secretary books it the name of the RED group. Since Perivale Park has a lot of green and the athletics track itself is red, the project name seemed a natural! On to some details of what we plan to do over the next year. 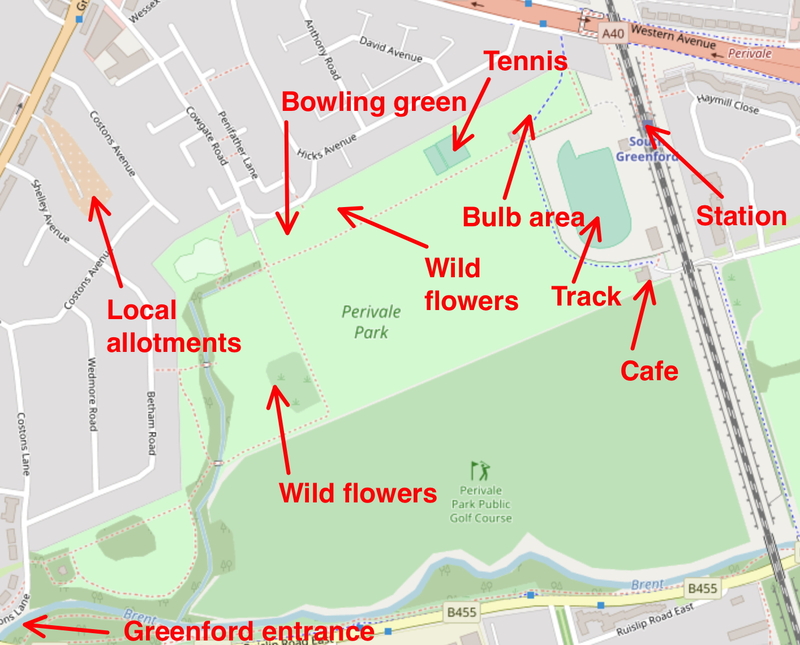 In the autumn of 2018, we will be planting hardy naturalised bulbs to brighten up the walk into the park from South Greenford Station (you can get here from trains leaving West Ealing, which is part of the Elizabeth line, formerly the Crossrail project). Once we have dates settled, a call for volunteers will go out. Watch this space! We are currently forming a design for the bowling green, based on an orchard theme. Once mature, we hope visitors to the park can pick the fruits in the autumn. As part of our researches, we have visited four other converted bowling greens in Ealing and in the following post I will show a few photos of these which have inspired us with ideas. More ideas are always welcome. Signage explaining the wild flower plantings and the bowling green site will be erected. We are liaising with the London National Park City Project, and will post news and events of their activities here as well, including their Station-2-station walks resource. Four walks starting at South Greenford station are already documented on this site. Other green spaces groups in London are also welcome to post news here. There is much more going on with the local community and I hope to post news of that here as well. Of course we are not going to do this all ourselves. The parks department in Ealing Council has been fantastic in helping with all aspects of our project. I hope that they too can contribute to this site with much more information about Perivale Park in particular and Ealing parks in general. Previous PostPrevious Perivale Park, London. July 7, 2018. Next PostNext Perivale Park, London, July 10th.